20 Sandhill Crane ~ 2nd Row From the Ocean! Designer decorated, this 6 bedroom, 2nd row ocean view home includes all the amenities you would expect to find in a premier luxury home. Located next to the beachwalk with easy handicap access to the beach and no steps, this extraordinary home has a large private pool and spa*. There is an outdoor semi private shower area only 50 yards from the beach. 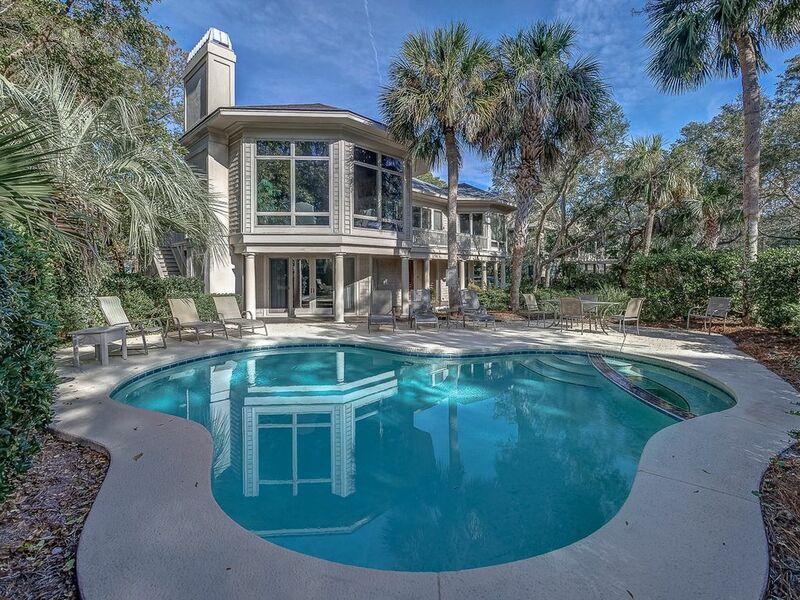 20 Sandhill Crane is completely private and surrounded by lush tropical landscaping. Many rooms open to wrap around porches, decks, and balconies. Like-new multi-million dollar home is over 5,000 square feet, and the interior is completely renovated along with new furnishings. There is a beautiful great room upstairs featuring a gourmet kitchen with custom cabinets, granite countertops, and top-of-the-line appliances. In addition to a breakfast bar, which has 4 highback chairs, there is a unique elongated granite counter in the great room with 6 chairs. For your convenience there is also a wet bar and half bath off the great room as well. Whether sharing meals or watching a movie on the 52 inch LCD flat-panel TV, it is perfect for family gatherings. For additional seating, there is a formal dining table for 8 with a second wet bar. Adjacent to the great room are two upper decks with Adirondack chairs and a gas grill. Downstairs is a family room featuring hardwood floors, full wet bar with wine cooler and ice-maker, new 46 inch LCD flat-panel TV and sleeper sofa. Guests can access the swimming pool and spa, as well as the covered terrace that wraps around the house. The 1st floor has 3 bedrooms, each with a private bath. A queen bedroom facing the pool area has a combination tub/shower. The 2nd queen bedroom has a travertine shower only, and a small deck. The third bedroom has a king bed, a large shower only, and a small deck. On the second level there is a 1/2 bath, and one oversized bedroom with a queen bed, two twin beds, and a full bath with a combination tub/shower. On the third level, the spacious first master suite offers a king bed, a cozy sitting area with 2 upholstered armchairs, and access to the upper deck. A gorgeous private bath features a sunken jetted tub with a window, a separate large shower, and double vanities. The 2nd master suite has a king bed, a sitting area and desk, and glimpses of the ocean.It also has a very large, luxurious private bath offers a sunken jetted tub, huge corner shower, and double sinks in light-colored granite. Both masters have 37 inch LCD flat-panel TV`s. There is a 2nd 1/2 bath on this level as well. 20 Sandhill Crane boasts many other fine appointments and amenities throughout to provide a casual, but elegant vacation. Guests must provide their own beach/pool towels! Great house and great location. Online quotes do NOT include additional car passes ($16.50) and/or pet deposits (if applicable). Please send inquiry for full price quote. Please call or send email inquiry for stays longer than one week. Online quotes do NOT calculate correctly for longer term rentals or for stays that overlap two different rate periods. Monthly rentals are four full weeks, Saturday - Saturday. Call for Specials and Hot Deals. Mention you saw it on VRBO.